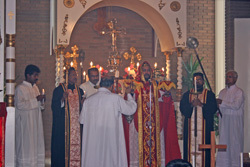 The priest offering incense along with deacons holding candles move in a procession around the altar. 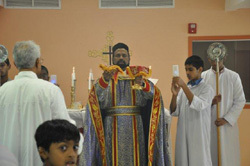 The priest represents Christ, the High Priest. The deacon who leads the procession represents John the Baptist, and the other deacons represent the Apostles and Disciples of Christ. 'Holy art thou, O God! According to Bar Sleebi three sets of angels came down at the time of burial of Christ. They sang, the first set 'Holy art thou god', the second, 'Holy are Thou mighty', and the third 'Holy art Thou immortal' and Joseph of Arimathea and Nicodemose (Mark 15:43) inspired by the Holy Spirit burst forth 'Thou that was crucified for us have mercy on us'. God is a trinity and so the number three has special significance. After the Trisagion the priest and the congregation chant kurielaison (Lord have mercy upon us) thrice. The church has accepted this Trisagion as a prayer to be said at the beginning of every prayer. 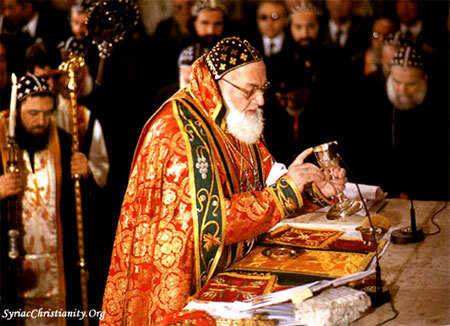 In the Syrian Orthodox Church, there are three readings, one from the Acts, one from St. Paul and one from the Gospel. They are each preceded by a chant. The first reading is done by the deacon from the northern side of the chancel, standing on the steps. It represents preaching of the gospel to the Jews. The second reading is done form the southern side, representing preaching of the gospel to the gentiles. The reading from the Gospel is done with great solemnity, as in all liturgies, the priest standing in the center of the sanctuary, while the servers carry lights and incense. The two lighted candles on both sides of the Gospel reading table point out that the word of God is light. The situation is made more reverberating by the sound of the bells ringing, the sound of the Maruvahsa. 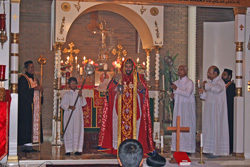 The proemion and Sedro are the typical form of solemn prayers in the Syriac church. It first offers praise and thanksgiving for the blessing which God has bestowed on us, above all in the sacrifice of his Son, then makes petition for his grace to be given to his people. There are seven different proemions and sedros which may be used for the Qurbana. The prayers for the blessing of the censer are proclamations of the faith in Trinity. The chains on the censer represent the Holy Trinity. The first chain stands for God the Father. The second and third chains represent the human and Godly nature of the son. The fourth chain represents the Holy Spirit. The priest puts incense in the censer and grasps one of the chains and makes sign of cross over it and says: 'Holy is the Holy Father'. Grasping two more chains the priest proclaims: 'Holy is the Holy Son' and finally he grasps the last chain and says 'Holy is the Holy Spirit'. What does the priest pray privately in the kneeling position? While the creed is being said, the priest turns to the clergy and people and asks for forgiveness and requests them to pray to the Lord to accept his oblations. 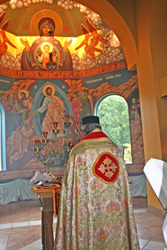 The priest then kneels before the altar and beseeches the Lord for remission of sins and acceptance of his offering. 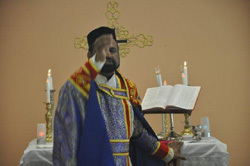 The priest prays for and makes the sign of the cross with his right thumb on the altar mentioning the names of those alive and departed for whom prayers have been requested. The word 'Ana' means 'Up' and 'Phora' means 'to carry'. The Anaphora is the solemn prayer of thanksgiving which our Lord uttered at the Last Supper and the works and actions which He used when he instituted the Eucharist. The original Anaphora of the rite of Antioch is that of St. James, but there are a great many others, eighty-eight in all, which were introduced in later times. Of these about sixty-four have their authors identified, which may be used for celebration. After the kiss of peace, we bow our heads. This is to express our humility and receptive mood for Gods blessings. According to Bar Sleebi, we collectively bow before Christ who sees all secrets and cleanses, lightens, and completes each one as he or she deserves. When the Holy sacrifice is about to begin the veil is lifted form the paten and chalice and solemnly waved over the offering. The prayer which the priest says, compares the veil to the stone which covered the sepulcher (tomb) of Christ, which is now rolled away and to the rock of the desert which gave water to the people of God, signifying the water of life which Christ gives to his people in the Qurbana (2 Cor. 10:4). The dialogue between the priest and people which follows is one of the most ancient liturgical formulas found in all liturgies at this point. The people are asked to lift up their hearts and minds to where Christ sits, at the right hand of God the Father, and then to give thanks. Then the congregation breaks with the song of the angels 'Holy, holy, holy'' (Isaiah 6: 3) and 'Blessed is He that cometh'' (Psalms 118: 26) recalling that the angels are present at this solemn moment, joining their praise to that of the church on earth. 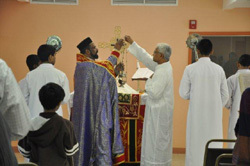 The priest narrates that which the Lord did, and blesses the bread and wine by making the sign of the cross. Thus, they become the Body and Blood of our Lord. If we allow Him to bless us, just as the ordinary bread is changed to His Body, we ordinary men and women, our ordinary lives, are thus transformed into the vehicle of God's grace (Jn 2:9). By giving His blood, our Lord has given us everything He has. He makes our whole being His, when He blesses us. The priest and the people together recall the mystery of the death and resurrection of Christ which is made present in all its saving power, while they look forward to the second coming of Christ, for which this mystery prepares them. The spoon and cushion are lifted up and placed on the left side of the Thronos (Altar). The priest lifts them over head in his right hand quickly, signifying the second coming of the Lord on the last day, which will be like a flash of lightning. 'For just as lightning comes from the east and flashes even to the west, so shall the coming of the Son of Man be' (Matthew 24:27). The consecration is followed by invocation of the Holy Spirit in which the Holy Spirit is called upon to descend upon the gifts. The mystery of the Holy sacrifice is considered to be complete and perfected by the action of the Holy Spirit. 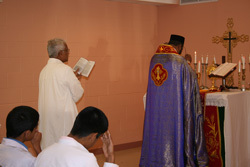 The priest waves his hands over the bread and wine with a fluttering motion, signifying the descent of the Holy Spirit. We find the deacon warning the people to stand in awe as the Holy Spirit is descending and hovering over the mysteries. The Holy Spirit is here represented by the dove, flying and hovering over (Mark 1:10). The hands signify the wings of the dove. This is followed by the thrice repeated earnest prayers of the priest. 'Answer me, O Lord' and the people respond with a three fold, 'Kurie-elaison' meaning 'Lord have mercy'. This reminds us of the repeated prayer of Elijah on Mount Carmel to send down fire from heaven upon the sacrifice - 'Hear me, Lord, hear me' (1 Kings 18:36-39). The coming of the Holy Spirit upon the offering is to transform the offerings into the Body and Blood of our Lord. St. Stephen, Known as the head of deacons and is the first martyr of the Church. He was stoned to death. Death looming, he saw the heavens open and the Son of God standing at the right hand of God (Acts 7:56). 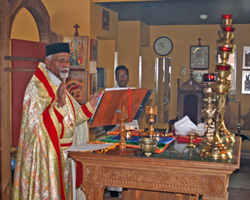 The church commemorated his memory through the feast held on the 8th of January. St. Peter, Was called to tend the Church by Lord Jesus Christ and is thus known as the chief of the Apostles. He is the foundation of the One Apostolic and Catholic (Universal) Church and was the first Patriarch of the Church of Antioch (Mathew 16:17). He was publicly crucified by the Emperor of Rome. He was nailed to the cross with his head downward, at his own request, symbolically kissing the feet of His Lord (Pollock, 1985). St. Paul, The greatest evangelist of the church. Originally a persecutor of the Church, he transformed into its most eloquent leader. He was born at Tarsus and was known as Saul. He was finally condemned by the Roman Senate and was beheaded on the same day St. Peter was crucified. His memory is commemorated by the Church on the 29th of June along with that of St. Peter. St. Thomas, It is traditionally believed that He arrived in Malankara (Kerala) in A.D. 52. 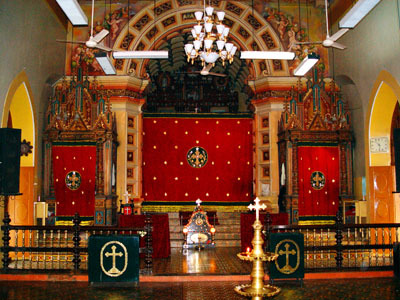 It is believed that St. Thomas installed seven crosses in different parts of Kerala and performed several miracles. St. Thomas was martyred at Mylapore, near Madras, India in A.D. 72. His mortal remains were transferred to Uraha (Edessa) in A.D. 394. The feast of St. Thomas is celebrated on July 3rd, presumable the day the mortal remains were transferred to Uraha. 6. For the faithful departed. The names of the departed for whom the Qurbana is said are remembered, after a silent prayer. The priest draws the sign of cross on the right rim of the paten while remembering the names of the departed. The Church believes that the faithful departed are present in the Holy Mass along with the living faithful. St. Peter ascertains that the judgment is for both the living and the dead. Therefore, Jesus Christ preached the Gospel to the departed. 'That is why the Good News was preached also to the dead' (1 Peter 4:6). Thus the congregation intercedes for the remission of sins of the faithful departed, so that the Lord may make them worthy of inheriting the heavenly kingdom. Why is the Sanctuary closed after the above? The Fracture and Commixture performed by the priest while the sanctuary is hidden: The breaking of the host (bread) signifies the suffering and death of our Lord. The priest breaks the bread and anoints it with the precious blood, signifying that the body and blood of Christ, which are separated in death, were reunited at resurrection. Then the host is lifted signifying our Lords resurrection. The Seraphic Hymn (While sanctuary is hidden) 'Anpudayonae' (Hearken gracious): Hymn is based on Isaiah's vision (Isaiah Ch. 6). It describes the worship of the seraphim and our desire to draw near to our Lord. The veil is opened at the end of the resurrection of the Lord symbolizing the appearance of our Lord to His disciples after his resurrection several times, before Pentecost. It is the family prayer of the Church, addressed to the Father in heaven by His little children. It is all inclusive, and can be used for every kind of intention. Every clause is wonderful in its combined depth and simplicity. But its very familiarity makes men repeat it hurriedly without thinking of its meaning in other words, saying it, instead of praying it. This we must avoid. The priest holds up the sacred mysteries, bells rings, two lighted candles on either side, and fans on either side shaken (Acts 1:10). The deacon calls to watch with fear and trembling, emphasizing the solemnity of the occasion. This commemorates the ascension of our Lord Jesus Christ to heaven. Why is the sanctuary closed again? It symbolizes that our Lord is now hidden to our bodily eyes and also the age in which the Church awaits the second coming of our Lord. The veil is then opened symbolizing the second coming of our Lord and the Day of Judgment. The priest, carrying the paten in his right hand and the chalice in his left hand, turns counter-clockwise to face the congregation to specially signify the coming of the Lord of judgment. This is in contrast to the usual clockwise turn, which is symbolic of the first coming of our Lord as the Redeemer. The priest then proceeds west in a procession which signifies the anticipated second coming. The priest returns to the altar where he sets the paten and chalice on the tablitho. Different churches use different times for giving the qurbana to the faithful. In most of the Jacobite churches, the qurbana is given after end of the public service of Qurbana. In some cases, it is given at the end of "Dhoopa Prarthana" and before the second coming. In some cases, it is given in the middle of the second coming service. You should fast at least for 6 hours prior to receiving the Holy Qurbana. Also, you must confess before a priest before taking the qurbana. 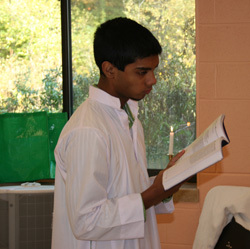 (Confession is mandatory if you wish to take the qurbana during Passion week (especially Monty Thursday or Pessaha.) Other times, the priest will prepare you to receive the holy mysteries by a Hoosoyo service. You must come prepared for the Hoosoyo service after proper introspection and prayers of repentance. 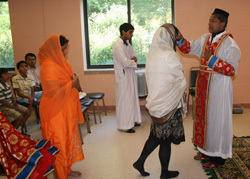 The Qurbana is concluded behind the veil when the priest completes his communion. 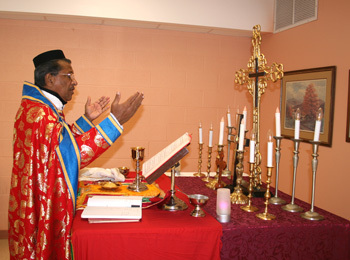 He concludes by kissing the altar three times saying: 'Farewell, O Holy and divine altar of the Lord. Henceforth, I know not whether I shall return to Thee or not.' This reminds that death is always at the door and makes us vigilant in preparing ourselves to meet the Lord whenever the call comes.